Learn more about the Lorex Camera Security System with 4 Ultra Wide Angle and PTZ . Get pricing, and answers to common questions. 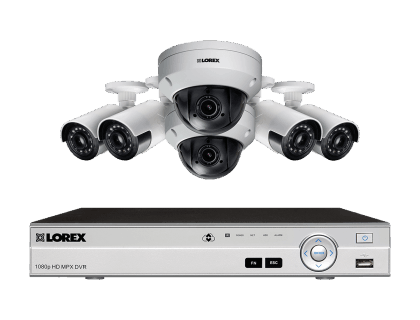 The Lorex Camera Security System with 4 Ultra Wide Angle and 2 PTZ comes with a HD digital video recorder (DVR), four HD ultra-wide angle security cameras, and two HD 1080p pan-tilt-zoom (PTZ) security cameras. This Lorex security system is good for large-area monitoring. 2 PTZ + 4 wide-angle security cameras. 90ft maximum night vision range. 2TB hard drive, expandable up to 4TB. Pros: Focuses on fine details. Captures small and distant objects. Cons: May be out of budget for some smaller businesses. Bottomline: Complete security system that is ideal for monitoring your businesses doorways and yards. What are some alternatives to the Lorex Camera Security System with 4 Ultra Wide Angle and 2 PTZ? Where can I buy the Lorex Camera Security System with 4 Ultra Wide Angle and 2 PTZ? The Lorex Camera Security System with 4 Ultra Wide Angle and 2 PTZ is available via Amazon and the Lorex website. Does the Lorex Camera Security System with 4 Ultra Wide Angle and 2 PTZ work at night? Yes. It comes with four LBV2561U cameras with infrared (IR) LEDs that provide excellent coverage in the dark. These cameras have a night vision range of 90 ft. in ambient lighting and 60 ft. in total darkness. Can the Lorex Camera Security System with 4 Ultra Wide Angle and 2 PTZ be used in any weather? Yes. The Lorex Camera Security System with 4 Ultra Wide Angle and 2 PTZ comes with weatherproof security cameras that can operate in inclement weather. The four LBV2561 cameras can operate between -4°F and 122°F, and the two LZV2622B cameras between -22°F and 122°F.